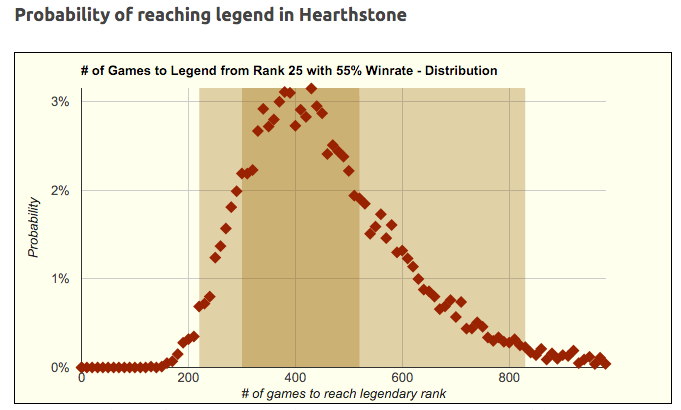 How long does it take to achieve the legendary rank in Hearthstone? This handy simulator will answer to this question and show how long it will take to reach legendary depending on your win rate and your current rank. How does it work? Just enter your rank and your win rate and hit calculate. Depending on your machine it might take a couple of seconds for the simulator to run. You can adjust the maximum number of games to simulate to fine tune the results. A detailed explanation of the features is given below. Ranked Mode changes starting February 2019 are taken into account. Beginner ranks (50 - 26) are not included. Golden areas show confidence intervals. Light is the 70% and dark is the 95% confidence interval. Your results will fall into those areas in 70%, respectively 95% of all cases. 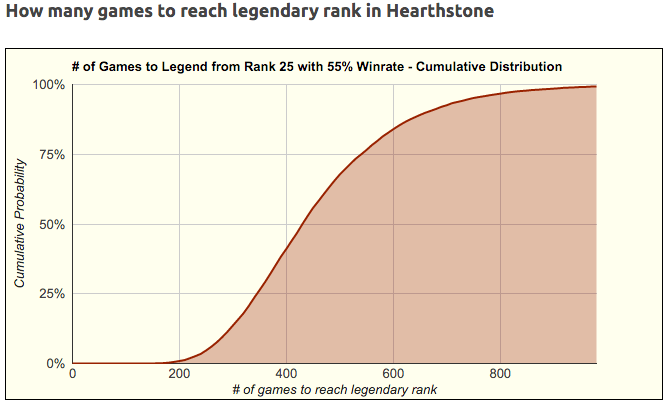 Cumulative probability of reaching legendary in Hearthstone. I.e. : You will reach legendary within X or less games with probability Y.
Decimal places in rank represent stars. How does the Hearthstone Legendary Simulator work? Once you hit calculate the simulator runs 10,000 simulations of a player with the given win rate and starting at the given rank. Each simulation runs until it hits legendary or the maximum number of games is reached (1,000 by default). Among other data the simulator determines the average number of games it takes to reach legendary, standard deviation and confidence intervals. Please note that the simulator only simulates (ldo) and while 10,000 runs is quite a lot, the numbers will fluctuate a tiny bit when hitting the calculate multiple times. For win rates below 55% you need to adjust the maximum number of games, but exercise some caution – numbers too big might crash the script. What does the simulator show? 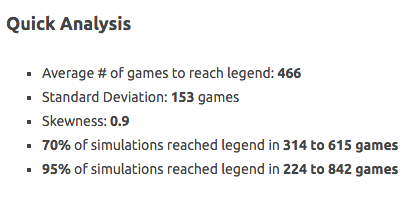 Average # of games: The arithmetic mean of the number of games of all simulations until they reached legendary rank. 70% / 95%: If you remove the results of 30% of all simulations (the top 15% and the bottom 15%) this interval shows how many games you’ll probably (in 70% of all cases) need to play to reach legend. The 95% interval is bit wider, removing only the top 2.5% and the bottom 2.5% outliers. It’s 1 in 20 that you’ll need more games to reach legend or accomplish this feat in less games. This chart shows the distribution of all simulations. Number of games to reach legendary are on the x-axis, the probability is on the y-axis. Note the golden areas – those are the 70% and 95% confidence intervals. Meaning: in 95% of all simulations the player reached legend somewhere in the light golden area and in 70% of all simulations he reached legendary in the dark golden strip. This chart is basically the same as the one above, just with the probabilities added up. The x-axis still shows the number of games and the y-axis shows the probability of reaching legend in x or fewer games. 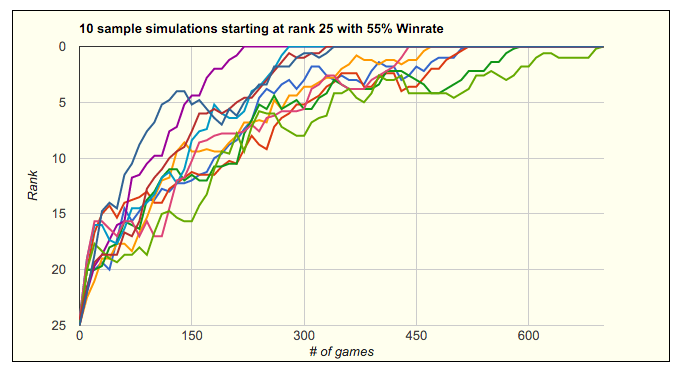 This chart shows 10 (out of 10,000) simulations and how the simulated Hearthstone players climbed over time to reach legend. This table shows ten percentiles of all simulations - the top 10% that reached legend the quickest, the next 10% and so on until the slowest. This gives some more numbers to the variance that can occur. Those simulations were all done with the same win rate for each game, yet in the example on the right, the top 10% only needed one third of the amount of games the bottom 10% needed. Those top 10% were not better in any way, they just were much more lucky than the bottom 10%. Well, that’s eSports (or anything that has random elements in it). Very simple: Shows the probability of losing the next X Hearthstone games in a row with the given win rate. While those numbers might seem small, don’t underestimate their significance over many games. Playing 100 games you’re almost guaranteed to lose at least 4 or 5 games in a row at least once. The simulator abides by the rules of Hearthstone. No stars are lost for losses below rank 20 (and on the lowest level of ranks 15, 10 and 5) and whenever three games are won in a row the player gets a bonus star (part of a rank). Those bonus stars only apply until rank 5. Never am i ever lucky i have 80% winrate over 5 games, and after this it took me 1300 games to reach legend. Game is rigged against me for sure…. Damn this is great guys, the simulation model is quite accurate and the results are given in less than a blink. The info charts are very useful as well. I want to highlight the great use a player at higher ranks can make of the losing streaks info in order not to get “tilted”. I mean, the numbers are cold and statistical, the simulations don’t take into account that tilt you may experience. And actually the probability of getting a losing streak of a whole rank (5 stars) is pretty low. Seeing something as simple as this actually encourages you to stay like “This decission-making rules I’m using are 55% winrate – If I don’t change them at all I’m hitting legend in around 200 games – AND LOSING STREAKS WILL HAPPEN” through the whole road from rank 5 instead of fckin tilting when close to legend. Done now. Even taking into account the changes with patch 10.2. Hello! Do you think this tool could be updated for the new rank floors? Similar to rank 20, they recently added “floors” at ranks 15, 10, and 5 as well. Thanks! I was wondering if you could email me the formulas you’ve used to get the charts. I am conducting a mathematical investigation on the standard deviation. It would be a massive help. It’s awesome. It can be cool to have the same thing for reach the rank 5. A lot of people play for reach rank 5 because legends reward and rank 5 reward give both the golden epic card. This simulator has definitely done everything I wanted from it and more, thanks. hey i’m emailing on behalf of my boss who’s is publishing an ebook on staking and would like to reference and use your calculator in the section on tournament variance. Would appreciate if we could continue via email.